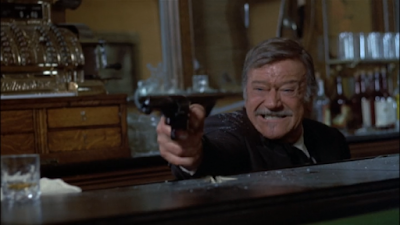 In John Wayne’s final film, old legends die hard. A few months ago, I started my write-up on The Outlaw Josey Wales with this line: “Outside of John Wayne, there is no actor more associated with the western genre of film than Clint Eastwood.” I believe that statement is true, and John Wayne’s connection to westerns seems to be woven into the fabric of American myth. We have our legends and we have our icons, but then there’s John Wayne, who transcends them all. This larger-than-life man became the embodiment of a hero for millions, and somehow managed to hold on to that status for decades. There are a lot of things you could say about the man, both good and bad, but it doesn’t change his status. It doesn’t matter who Wayne was behind the scenes, or what his weaknesses and failures were; he has become one of our patron saints of American cinema alongside James Dean and Marilyn Monroe. John Wayne IS the American western film. But every trail comes to an end, and John Wayne in 1976 was only a shell of the man he had been. The star had lost a lung to cancer, and would soon lose his stomach as well. The figure that rides in the saddle of Don Siegel’s The Shootist is a shadow, hoarse of voice and beaten by illness and age. In reality, John Wayne was elderly and diminished, and this would be his final film. 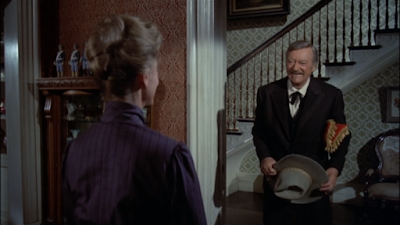 Though it might not have been planned as such, this movie is John Wayne’s goodbye. It’s hard to watch your heroes grow old and wither, and that’s doubly true for an actor like John Wayne who made a career out of stubborn resolve. But then again, every line on his face tells a story, and all of these factors make The Shootist unique in his filmography. The movie chronicles the final days of a dying gunslinger as he seeks to find some closure on his life and come to terms with the inevitable. Riddled with inoperable cancer, Wayne’s character, J.B. Books, comes to the conclusion that the best way for an old shootist to leave this world is on his feet rather than on his back. Tellingly, the story takes place in the late winter of 1902 when cars join horses on town streets. The west of The Shootist isn’t as wild as it once was, and the winter in this movie seems symbolic of both Wayne’s career and the West of American legend. The parallels between what is happening on screen and what was going on in Wayne’s real life make this a difficult film to sit through, but it’s not the fault of the movie itself. In fact, while Don Siegel’s story doesn’t shy away from the sadness of death, it does attempt to avoid lingering on the maudlin and melodrama. This wasn’t supposed to be Wayne’s last film. I’ve read that his cancer was in remission and had been given as much of a clean of a bill of health as a hard-drinking, hard-living man of nearly seventy can be given. Also surprising is that this movie wasn’t even written for John Wayne: it was offered to Charles Bronson, Paul Newman, and Gene Hackman, but they all turned it down. I recognize all this as fact, but it’s still hard to argue against how much this movie feels like goodbye. The movie opens with archival footage of John Wayne being John Wayne in black-and-white movies from Hollywood’s Golden Age, giving us context for the character’s status as living legend and reminding us of the glory days. 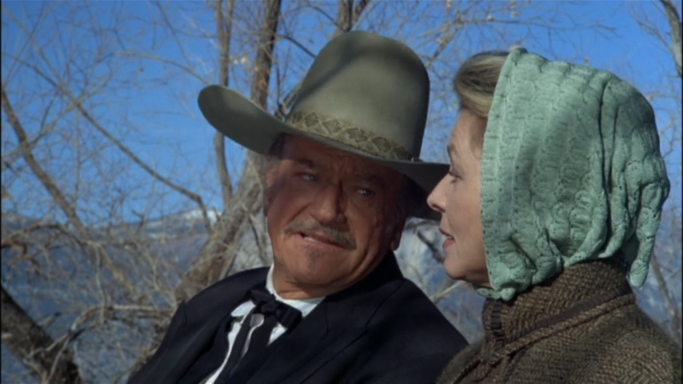 Wayne personally hand-picked most of his co-stars, requesting actors he’d enjoyed working with in the past like Lauren Bacall (Blood Alley), Jimmy Stewart (The Man Who Shot Liberty Valance), and Richard Boone (Big Jake). Ron Howard also appears as a young and impressionable character who worships the legacy of Wayne’s character. Given all these circumstances and the tone of the script, it’s hard for me to believe that this wasn’t crafted as some sort of a farewell. The last piece of evidence to support the notion that everyone knew Wayne’s career was winding down is the film itself. Watching The Shootist, it’s obvious that a “John Wayne movie,” whatever that label conjures, had run its course. The poor box office performance for this film further supports that notion. Given the film industry in 1976 and the variety of movies hitting screens, the kind of storytelling seen here feels old fashioned and outdated. That makes me sad to admit, but it’s true. The western, at least as it existed in the heyday of John Wayne, was over. 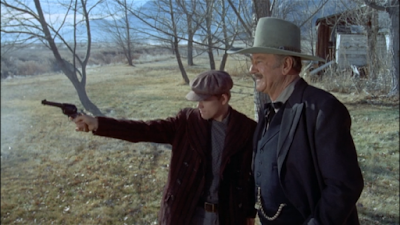 This movie, with its hero dictating his tombstone to the undertaker, pressing his best suit for one last trip to the saloon, and teaching his young admirer how to shoot a pistol, seems designed as a farewell. The acting in this movie is fantastic across the board. Wayne has a couple of modes, but the one we get here is one I’m not used to seeing. He’s quiet, subdued. There’s still that bravado that we all know whether we’ve watched any of his movies or not, but it’s tempered with sadness and regret. The character doesn’t have all the answers. It’s the same kind of thing we see in a more recent movie like Creed, when someone we’re so used to seeing as unstoppable finally hits a wall and we witness a struggle of a completely different kind. Wayne is far from his best physically in this movie, but there’s still a charisma underneath that must have been part of who he really was. Apparently, the star was suffering from heart problems, the flu, and an enlarged prostate during the course of the shoot. All of these things, as horrible as they are, seem to add to the overall fragility of the performance. Lauren Bacall shines just like she always does, portraying a widow who maintains herself with quiet dignity and a bit of weariness. There’s no such thing as a bad Bacall performance, and she’s one of those starlets of the Golden Age who could outshine any male co-star. Just as she never took a back seat to another icon, Humphrey Bogart, she doesn’t here, either. I also respect that this movie doesn’t try to force romance between Wayne and Bacall, instead allowing them to have a quiet, respectful friendship. They’re simply two people who carry their own sorrows, taking solace in the company of each other. This movie came during a period of limbo for Ron Howard. The former child star had American Graffiti under his belt, but was back on TV with Happy Days. To me, Ron Howard of 1976 feels like a person in transition. He’s very good at doing what this movie asks him to do, but it does feel like a step backward for his career. We will revisit the topic of Ron Howard’s trajectory in a few weeks, but for now, I’ll just say that this must have been a dream job for an actor who grew up watching Wayne on the silver screen. Jimmy Stewart’s role is little more than a cameo. He portrays the doctor who gives Wayne the bad news that his time is almost at an end. Reportedly, the scenes between John Wayne and Jimmy Stewart were difficult because Stewart couldn’t hear and Wayne kept fumbling lines, but it’s impossible to deny the power of the two men when they share the screen. Richard Boone, the once-handsome star of Have Gun – Will Travel, looks appropriately haggard as another aging outlaw type. As a fan of the show that made him famous and all the fifties westerns in which Boone appeared, I find his appearance to be unsettling here. Old movie fans will also notice Scatman Crothers, Hugh O’Brian, Bill McKinney, Harry Morgan, and John Carradine. 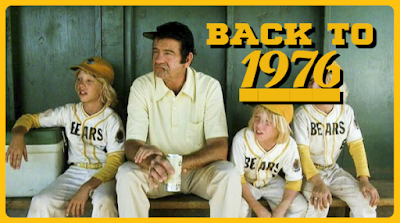 This movie focuses on the twilight years, which is even rarer now than it was in 1976. It points out that the story doesn’t end just because the hero rides off into the sunset. Old heroes and villains don’t always get a mythic end; sometimes they just get old and die. I find myself once again drawn to comparing the careers of John Wayne and Clint Eastwood, which is easy to do since The Outlaw Josey Wales came out the same year this film did and Eastwood was essentially the new model of what was perceived as John Wayne’s outdated and obsolete brand. Wayne was vocal about his disdain for the violence and gray morality in Eastwood’s films, as well as their grimness and twisted ethics. Wayne had, after all, turned down the title role of Dirty Harry and had written a resentful letter to Eastwood after the actor/director offered him a starring role in High Plains Drifter. And yet, it’s worth pointing out that Eastwood’s Josey Wales finds its mythic narrative by the time the credits roll, whereas The Shootist seems mostly concerned with doing away with the myth. Wayne describes himself in The Shootist as “a dying man scared of the dark.” There’s that vulnerability I’ve been talking about. This movie was directed by Don Siegel, the guy who helmed a bunch of Eastwood actioners and was also partially responsible for the anti-hero movement of the seventies. 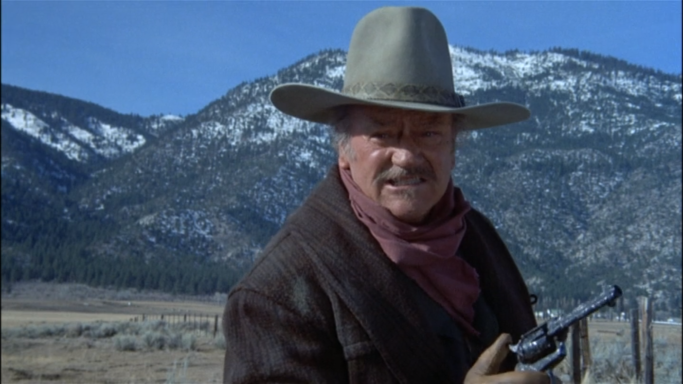 Yet The Shootist is a movie that uses restraint and puts action on the back-burner (it’s still there) in favor of reflective character moments. There are even rumors that Wayne took over directing duties from Siegel because he didn’t like the tone of the footage. If that’s true, I’m even more intrigued. Wayne was the king of western myth, and yet here is a movie in which it’s all been stripped away, revealing a tired old man. Ultimately, it’s that complete lack of glamour that defies our expectations. This is the only movie I can think of in which Wayne is so vulnerable and fragile. There’s even a scene in the film where J.B. Books slips in the bathtub; it takes place mostly off-camera, but Lauren Bacall tenderly sweeps in, wraps him up, and helps him to his bed. It’s a soft moment that doesn’t just show cracks in the veneer of a hard man; it shows total defenselessness. It’s surprising to see a man as proud as Wayne revealing his mortality so openly. Analyzing this film so closely has given me new appreciation for John Wayne in a way I didn’t quite have before. Don’t get me wrong; I love John Wayne. I love the myth. I thought I had a solid grasp on who he was, but this movie has challenged that view, especially when put into the context of what was happening cinematically during 1976. I’m not prepared to say that The Shootist is a great movie; I’m not even sure it’s a particularly good one. But it does feel deeply personal and vulnerable, and will forever remain the last performance that John Wayne committed to film. It’s triumphant and sad in the way that life really is, especially with the perspective of an entire life’s work coming to an end. Wayne’s career began in the serials and b-movies of the twenties and thirties. In the forties, he became a star. In the fifties, he was a household name. By the sixties, John Wayne was an American icon. Yet it’s here in the seventies, weakened and worn, that The Duke says farewell with a performance that I believe just might be one of his best. Just FYI, Wayne did indeed turn down Dirty Harry, but later regretted the decision after he saw the film and realized it was basically a Western in modern clothing. Wayne later made his own "modern cop on the edge" film with McQ. I saw McQ recently (for Junesploitation, I think), and quite liked it. As I pointed out in my post on the film, there is actually a sequence where McQ beats up a dealer to get his drugs, and then gives the drugs to one of his informants (expertly played by Colleen Dewhurst). So not even the Duke was immune to the 70's queasy morality. I agree that McQ is definitely in the same mode as Eastwood's work. Part of what interests me about all this is that Eastwood is often credited as stripping away the glamour of westerns in favor of violent realism while Wayne was all about the Western Myth and the ideal and the spirit of the frontier people. Yet both men seemed to be doing exactly the opposite during the seventies, with Eastwood making movies that perpetuate the mythic hero and John Wayne making movies where he was more flawed and human. Though I didn't come right out and say it in the article, I'm starting to think that Wayne and Eastwood were an awful lot alike, especially in the seventies. Or maybe Wayne was simply threatened by the success of Eastwood's harder, grittier approach and the success those movies achieved. Maybe it's both. That potential parity is super-interesting to me. I watched Lucky a couple days ago and the similarities between these films is remarkable. I know Harry Dean Stanton's has another film to be released, but Lucky just felt like such a perfect goodbye, as did The Shootist. It's hard watching John Wayne's final role without feeling the emotional weight. Waynes dialogue stripped away the veneer of his five decade old persona.